Silver Diner is one of my favorite breakfast joints. I love diners, and with all the snow we have had lately - getting out of the house was a must! 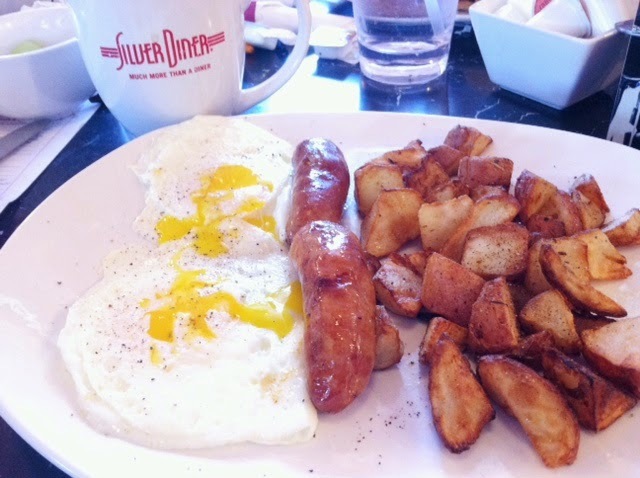 Silver Diner offers so many healthy options for any lifestyle. They even have gluten free french toast, and quinoa pancakes! I haven't tried them yet, but they look so yummy! Their menu is even locally sourced - which I love. Their prices are comparable to any other breakfast place you might enjoy too! I always get the American Favorite with the pork sausage links - so yummy! ooh how yummy! I haven't heard of it, but the pictures makes me super hungry!